World War I dramatisations invariably depict the ease of signing up – just walk into your local recruiting hall. Albert Borella, who received a Victoria Cross for his fight on the Western Front, had a personal battle just to apply his signature to the right form. The Borella Ride will bring Australia a portrait of a man so tough he fought a battle just to join the combat action of World War I. In 1915 Albert Borella journeyed through 1,000 kilometres of the Northern Territory’s outback from Tennant Creek to Darwin to join up to fight in World War I. Albert Borella walked, swam flooded creeks, rode horses, and finally hitched a ride on a train just to reach the northern port. There he was taken by ship to Townsville, and thence to training in NSW, and then on to Western Australia. Finally he was transported to Gallipoli. He fought; was transferred to the Western Front, was wounded, and won a Mention in Despatches, and the Military Medal, both honours of distinction. In 1918 he was awarded the Victoria Cross “For most conspicuous bravery in attack”, at 36 years of age the oldest recipient within the First Australian Imperial Force. 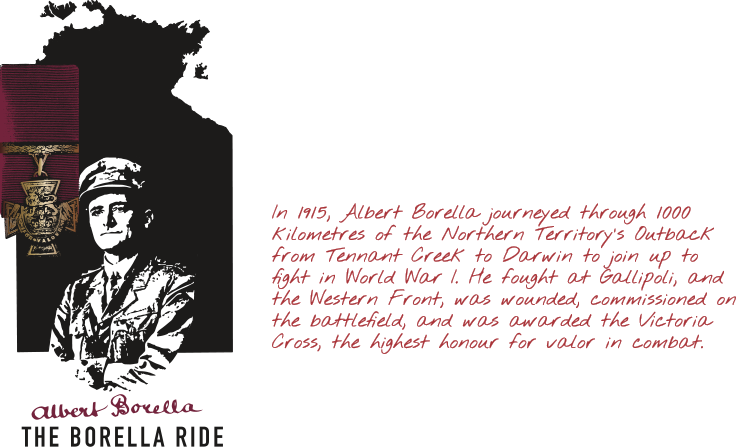 The Borella Ride, taking place in early 2015, will retrace Albert Borella’s journey to join up. Utilising a group of four selected Borella Riders, the event will duplicate essential elements of the journey, while also examining the motivation of WWI volunteers – there was no conscription in that war – and the difficulties and dramas of enlistment; as well as the realities of Territory travel. The Ride will provide an essential window into the actuality of 1915, as well as a thoughtful examination of the differences to today’s expectations, culture, and real life.